A colour slide of an aerial view of Whitby looking northwest. 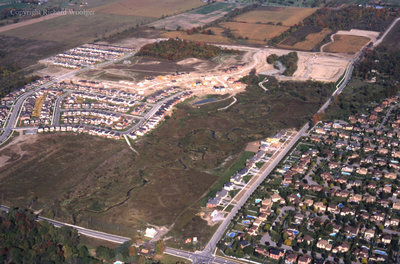 On the left side of the photograph is the Williamsburg subdivision under construction. The intersection of Cochrane Street and Rossland Road can be seen at the bottom of the photograph. Aerial View of Whitby looking Northwest, October 7, 1998, Richard Woolger. Whitby Archives A2014_014_010.